Cross Site Request Forgery (XSRF/CSRF) is a type of a security breech where a hacker can trick the user into making unwanted requests to a web application where he/she is already authenticated. When a user is authenticated, his/her authentication cookie is stored in the browser’s storage. Since the cookie stays active unless the browser is closed and reopened, an authenticated user can be forced to make requests to the application from other unsafe applications too. For example, assume that you are a customer of a bank which allows you to do online banking. If you have that kind of facility, then definitely you would want to make online transactions whenever you want. So, what you would do is you will log in to the online banking application then will make some transactions. Suppose while doing the transactions suddenly you’ve got a mail. This mail says that, “You won a jackpot! To claim that you have a go to a specific link to a web application where you have to press a big red button that says, Claim Million Dollar Now!”. Let me tell you what I would do in this scenario, I would leave everything and press the big red button because I want to be a millionaire. But not every day is a million-dollar day and maybe that red button wont do what its actually saying. Behind the scene that red button can cause a huge misfortune for us. Since it’s a button, it is very much possible that it could be a submit button and behind the scene there is html form too with some fields which are hidden. Suppose that the hacker who made that unsafe application knew that when a user makes a transaction on you current online banking system, it hits a specific endpoint on the server. So, what the hacker would do is he/she will create an action attribute on the form with that endpoint location. Now, with all the excitement going on the mind of a simple user like me won’t even bother to log out from my currently logged in online banking system and press that red button. And that's where a request will be sent to my logged in application and it will be treated as a valid request since my authentication cookie is still alive. Making a simple request won’t do any harm but remember that we talked about some hidden fields too. Upon clicking on a submit button will make a request along with every form fields values to our application over HTTP. So, if a hacker wants to steal my money then he can easily mimic a credit type transaction to his account from mine with all the fields necessary in a HTTP request. The values can be sent in both GET(as a query string) and POST (in request body) requests. So, the form's method attribute can be set to any of those. This is a very common attack and even the popular video website YouTube was vulnerable to CSRF in 2008. 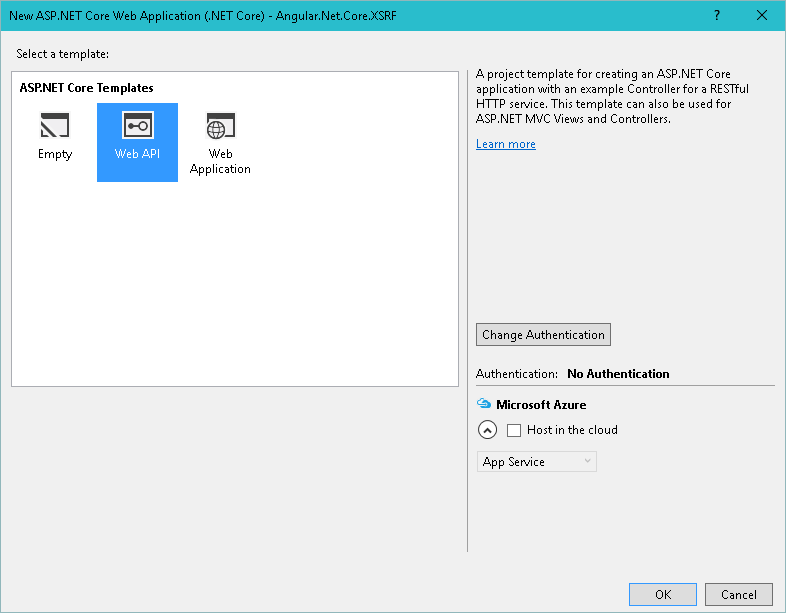 In this tutorial, we will be making an AngularJS app with Asp.net core Web API on the backend. In this application a user can make some simple debit and credit transactions against an account. We will see how XSRF can cause unwanted transactions against the account and then show how we can prevent XSRF exploits. 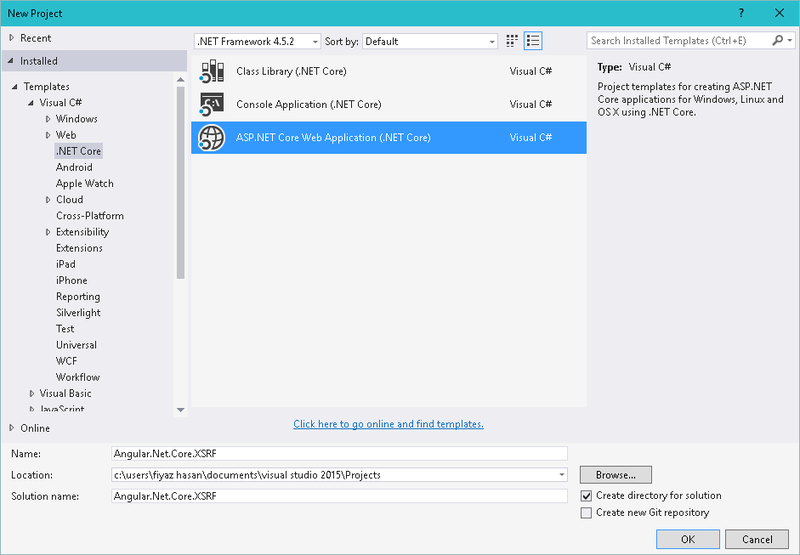 In Visual Studio 2015, create an ASP.NET Core Web Application and select the Web API template under ASP.NET CORE templates window. Note that this article assumes that you have the latest version (RTM 1.0.0) of ASP.NET CORE libraries installed in your PC. To resolve client side dependencies, we will use bower. Before installing bower, add a Bower Configuration File in your project. After installing bower, you can right click on the Bower under the Dependencies node and select Manage Bower Packages. From there search and install Angular. Also install Bootstrap. By default, installing packages with bower will create a folder called lib under the wwwroot and store the client libraries there. You can change the default directory of you client side library installation by changing the "directory" property in the .bowerrc file. Notice that we don’t have other library dependencies in our main module (empty ). In TransactionService, we have our GET and POST method. Later, when we will work with the Web API backend we will map those request to appropriate actions. We’ve injected the TransactionService into our TransactionController and used them where it is needed. We have added the antiforgery middleware in our ConfigureServices method. Notice that we have to configure the antiforgery middleware first. There we have added a HeaderName = "X-XSRF-TOKEN" option. This is because if we send a XSRF-TOKEN wrapped in cookie along with a request, angular will send back the same token in a header named X-XSRF-TOKEN when a POST happens. These two tokens must match to verify the request is coming from the same user as it should be. We must generate and send the antiforgery token when a request is made to either on the http:/app-name/ or http://app-name/index.html url. 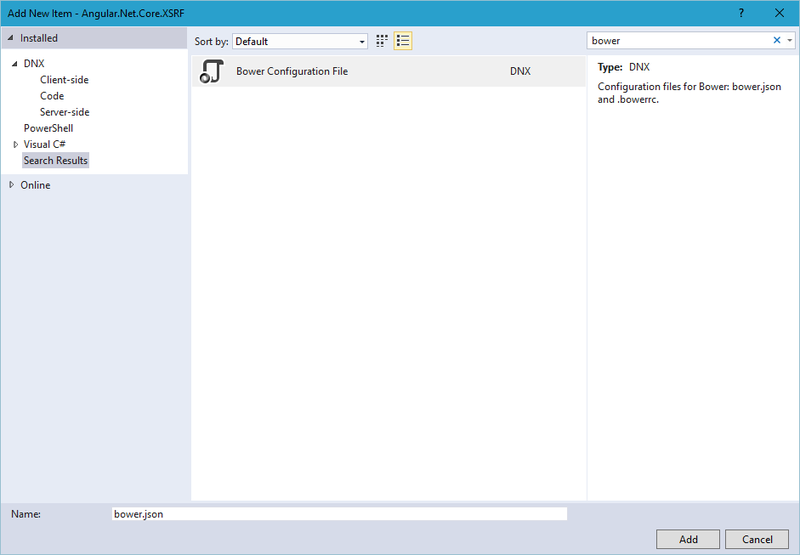 So, we’ve worked with the current context to do so in the Configure method. In GetTransaction method we returned all the transactions that were made and in the AddTransaction method we’ve implement some conditions to make a debit and credit transaction against an account created in the constructor. Now let’s add an API controller for exposing this two functionalities (AddTransaction, GetTransactions) over HTTP. 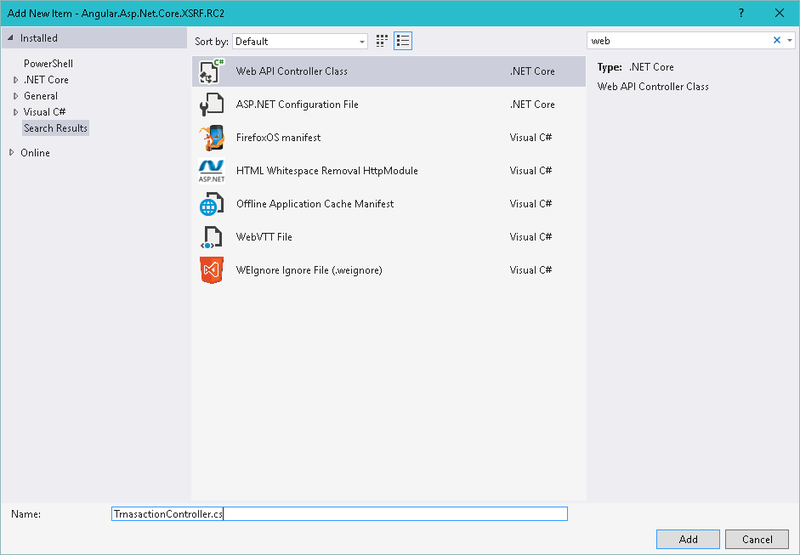 Add a folder named controller and add a Web API Controller named TransactionController. Now build and run the app. Going to the root url the application will generate a XSRF-TOKEN and store it as a cookie. Further when a POST request is made the same token value will be passed a header named X-XSRF-TOKEN. Here the other one is the application cookie. Now if you try to mimic the POST request and try making it from another domain or application, that simply won’t work. Because even if you manage to use the application cookie your XSRF-TOKEN will not match.